Map of Broken Coast circa 2E 582. The Broken Coast is the westernmost region of the Malabal Tor, consisting of the outer coast of the Abecean Sea. 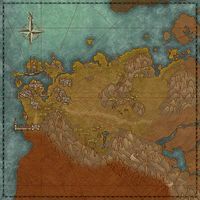 The city-state of Falinesti has the seasonal summer site located deep into the Broken Coast mainland, on the road in between the Broken Coast and the rest of Malabal Tor. The township of Velyn Harbor is the second largest settlement in Malabal Tor, due to its convenient location. The Wood Orc stronghold of Dra'bul is located on the eastern end of the Broken Coast, in an open area just before the Strid River Estuary. This page was last modified on 7 December 2017, at 01:09.